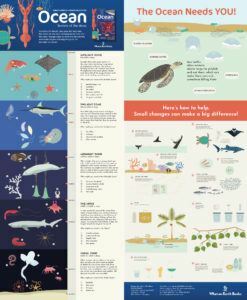 Amazing Oceans posters – Bounce Sales & Marketing Ltd.
Help your readers dive into the briny deep with this amazing Ocean: Secrets of the Deep. Double-sided, printed in the most gorgeous colours, it illustrates what readers can find in the depths up to 11,000 metres, including menacing sharks, playful dolphins, clownfish, penguins, turtles, whales, shimmering jellyfish and gargantuan giant squid. Ideal for Earth Day and World Ocean Day activities this is sure to help you shift a lot of copies of the brilliant Ocean: Secrets of the Deep.